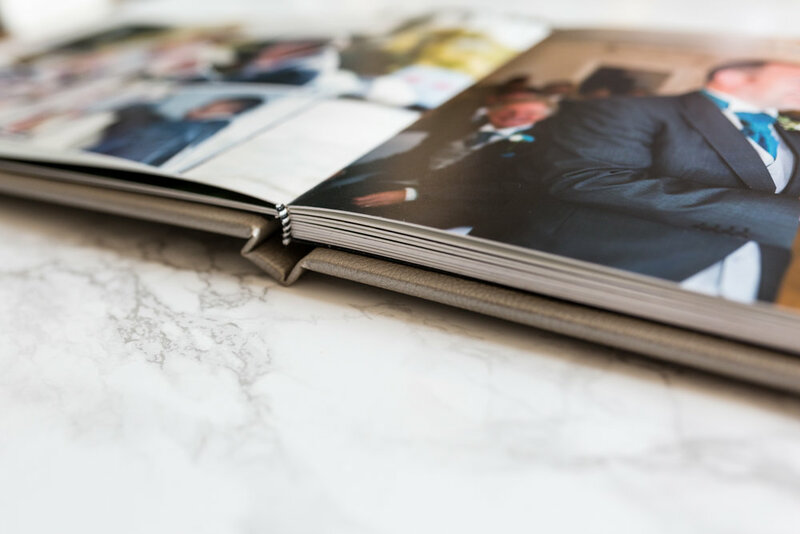 There is something special about printed images, especially when it's your wedding album. The feel of it gives you a warm sensation of happiness and ignites all those little memories from the big day. They say a picture says a thousand words, I kind of disagree. Sometimes there are just no words to describe that moment when you see your partner for the first time on your wedding day. Or the look on your dads face when he realises what the best man has just said about his new son-in-law. Some moments aren't meant for words, they're meant to be seen and felt. That tingling sensation when you see them is way better than any words. The digital age is upon us, every image you take is stored away on your phone, pc or tablet. For me, obviously I know i'm a photographer, but it's amazing to have some of the milestones in mine and my families lives printed up. A physical print that hopefully someday my child will be showing his family, reliving that particular story. Our Luxury Albums are surely something special, beautifully design and handmade by one of the top printing companies in the UK. The weight, the feel, the print quality... it all screams luxury! Printed on a photographic card that gives the album its robust feel, the album is designed to to tell your story with images chosen by you. It comes complete with a leatherette cover of you colour choice. I personally love the grey/metallic shown below! Memories are priceless, invaluable moments in your life that you always want to remember, but memories do fade. So, don't see this as an added cost to your day, see it as an investment for your memories. Prices for the Luxury Albums are £200 for a 12"x8" and £250 for a huge 16"x12", both come with 20 pages as standard. Let us tell your story and encapsulate it in our amazing Luxury Album, ready for you to share with your loved ones.